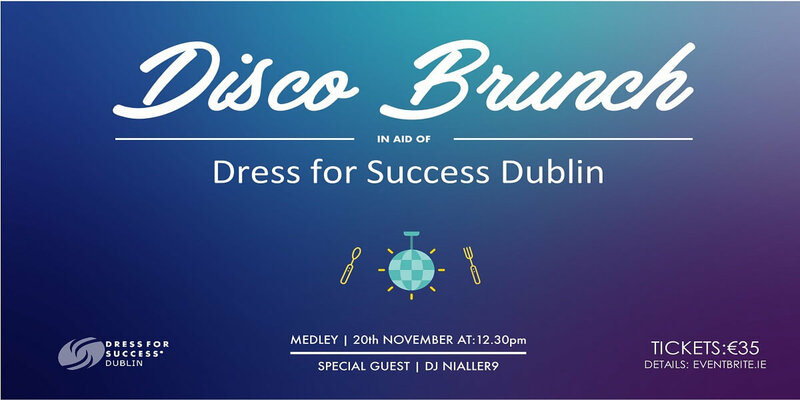 It’s time for brunch-lovers to get excited, as Dress for Success Dublin has announced details of a very special Disco Brunch taking place on Sunday, 20th November, at Medley Café Bistro on Fleet Street, Dublin 2. Food and tunes will be provided by some of Dublin’s best talent, including renowned chef Andrew Rudd and special guest DJ Nialler9. Sonya Lennon – designer, tech entrepreneur and founder of Dress for Success Dublin – will host the event, which is taking place as part of the Dress for Success Dublin Equal Pay Day campaign. The month-long campaign is aimed at raising awareness of the gender pay gap and supporting more women back to work. Announcing details of the Disco Brunch, Sonya Lennon said there has been strong demand for tickets to date. “This promises to be such a fun event, taking place in the fabulous surrounds of Medley Café Bistro and with disco tunes courtesy of the multi-talented Nialler9,” she said. “Andrew Rudd has developed a mouth-watering menu especially for the occasion, and we hope to have a few surprises and spot prizes to keep attendees entertained. Tickets for the Disco Brunch are priced at €35 and are on sale now through Eventbrite.ie. Sonya stressed the proceeds from the event will go directly to Dress for Success Dublin to help the organisation help more women back to work. In addition to the disco beats by Nialler9, highlights of the event will include the tasty dishes served up by the talented Andrew Rudd. · Eggs Benedict served on a blaa with bacon, poached egg and hollandaise sauce. · Eggs Royale served on a blaa with sautéed mushrooms, caramelised onions, sweet peppers and hollandaise sauce. · Creamed Risotto with peas, spinach and home smoked haddock. · Pancake Stack served with crème fraiche, fresh berries and maple syrup. · Panko Fillet of Hake served with crushed minted peas, tartar and mash.